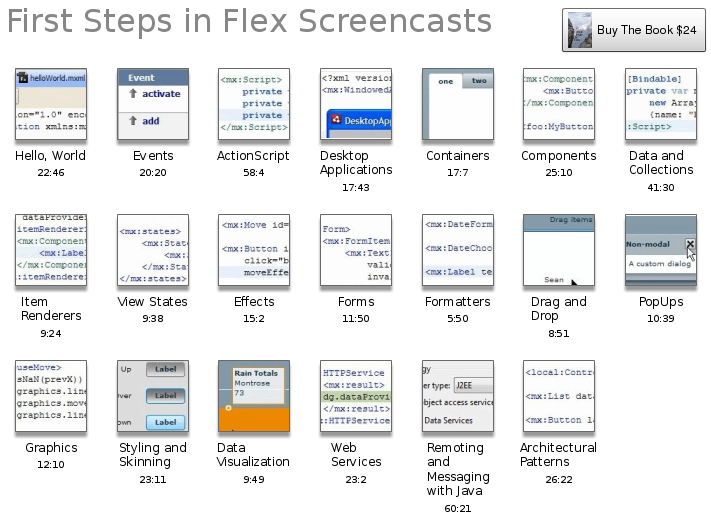 Just over a year ago, James Ward & I published "First Steps in Flex." Our goal was to make Flex easy by creating the shortest examples and chapters we could, to give you just enough to get started. We've just finished making free screencasts of all the chapters in the book. So far we've had great feedback on the book. The concise examples seem to resonate with the way that programmers learn. When I wrote Thinking in Java, I initially tried the experiment of giving the book away as a promotion to sell seminars and CDs. With First Steps in Flex, we decided to try the reverse experiment -- give away an electronic seminar as a promotion for the book. This is a bit upside-down because, ordinarily, the e-seminar is the high ticket item, what you "upsell" towards. But this being the internet, we can try it out and see what happens. We've tried to cover each chapter fairly completely. In theory, you could just use the e-seminars and get the same information. We took a casual, unscripted approach to the screencasts, so it feels like you are sitting in the room with us as we discuss the code. This weblog entry is Copyright © 2010 Bruce Eckel. All rights reserved.